I always knew I had trouble finding sunglasses that fit my face but I never realized just how small my face was until I ordered a pair of Ray Ban Aviators that EVERYONE had. These ones. They seemed to look so good on everyone! I thought wow, these are like the perfect “universal” sunglasses. Until I ordered a pair. They were so big that if I moved my head at all they would just fall off. I couldn’t believe it and it was then that I realized that my face was even smaller face than I originally thought. 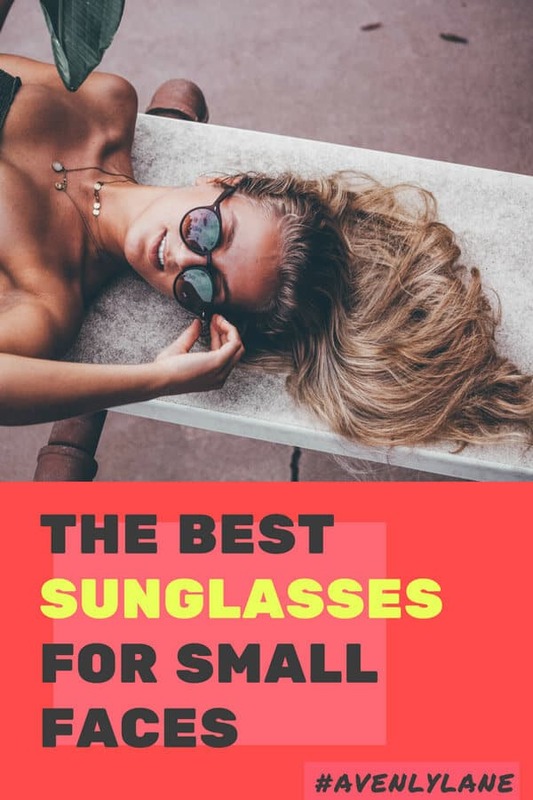 So if you are anything like me and have trouble finding sunglasses that fit your face shape or size hopefully this post will give you some tips so you can find the most flattering sunglasses for women with small faces. 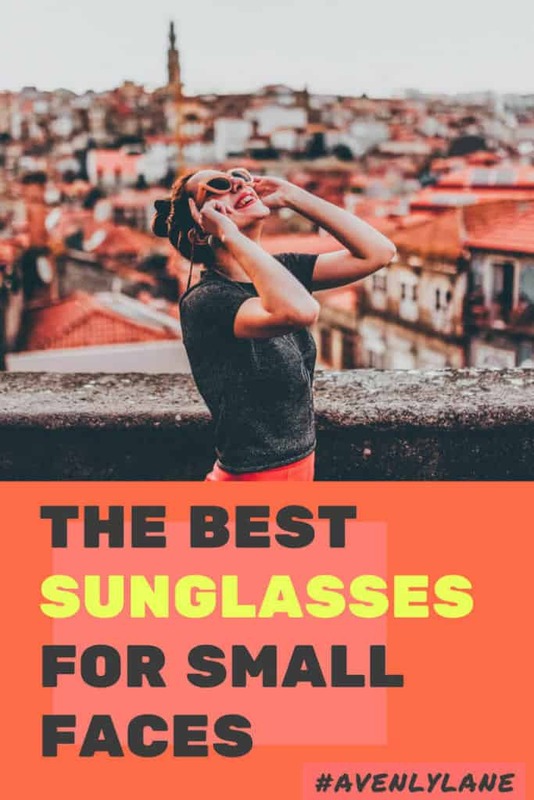 When looking at the best sunglasses size for a small face I would stay within 50mm lens width to 55mm and not go over 55mm lens width unless you want that really oversize look. I just recently went to Old Navy and figured I would give a few pairs of their sunglasses a try. To my surprise they ALL fit perfectly! They have the best sunglasses size for a small face! It’s like they were made for women like me. And one of the best parts is they are basically all under $12. I always like to have a few pairs of sunglasses that I can keep in the car or take hiking etc. that are really inexpensive so that I don’t stress if anything happens to them. Obviously you can find just about anything you want at Nordstrom. So when searching for sunglasses I recommend ordering online as many of the options you have to choose from online are not available at the stores. Ordering online with Nordstrom is completely stress free because they have free shipping and free returns all the time, no minimum order total required. You can buy a pencil and get free shipping! Anyone else hate it when you have to spend $150 to get free shipping?! Luckily since I purchased my last Ray Ban Aviator sunglasses that made me look like a bug they have made a “small” version for girls like us. They currently come in 5 different colors so you will have some options to choose from. 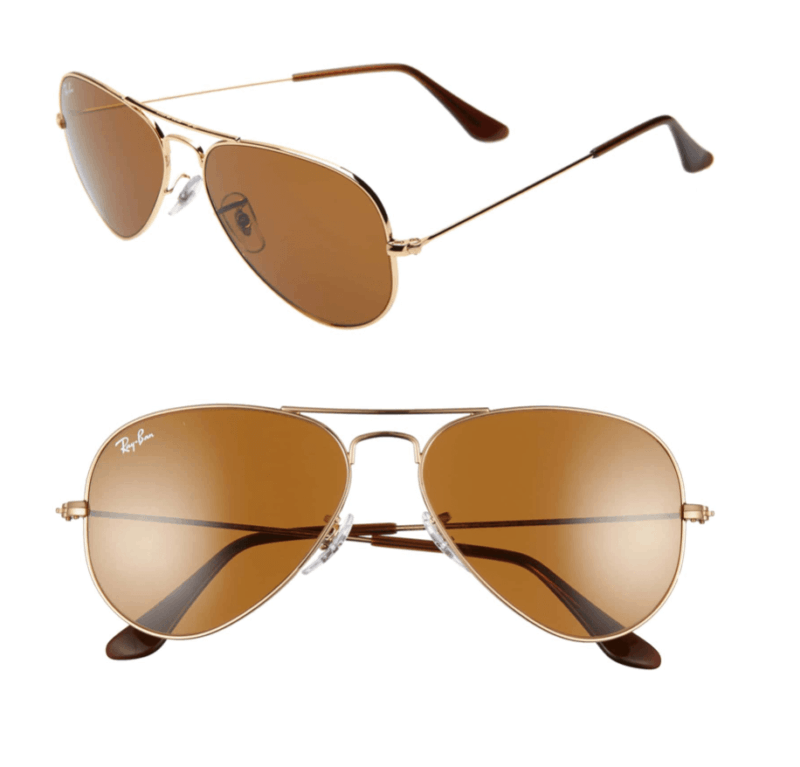 The typical Ray Ban Aviators are 58mm so it is so nice they now offer the smaller 55mm size. I just ordered 2 pairs from the Le Specs Brand sizes 51mm width and they fit perfect. Note – These are oversized. I personally like the look but if you do not think an oversized look will work for you then I would pass on these. This pair is also a bit oversized. If you don’t want anything oversized then I would would pass on them. But I love them and think they are super cute. Quay Australia is a very popular brand online as well. From what I can see they have great quality sunglasses with a variety of sizes for everyone. Including sunglasses for a small oval face. But again, just be careful to watch the width size as quay has a ton of styles that are 60 mm + in size. I didn’t know to look at the sizes before and ordered a pair that I saw a girl wearing on instagram and they looked on her. I felt like her head was about the same size as mine. (Is that weird? haha) I was wrong, they were HUGE! This pair is my current (2019) favorite from Quay. They don’t have as much details with the sizing on their website but I bought the pair I am wearing in the photo below from Old Navy and they were only $12. I have had them for years and still love them. I have tested and tried on every pair at the store and they all fit my face nice and tight which I love. There is no use linking individual ones because they are constantly selling out at such a low price point but here is the link to the women’s sunglasses page. They have some great ones right now. 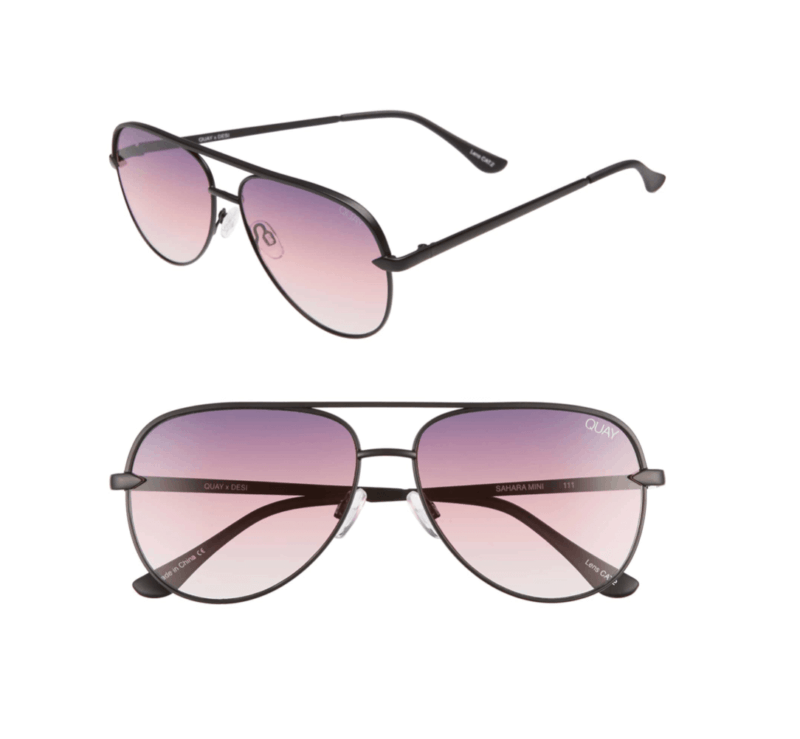 Including some aviators I just might have to try out. If you look at the info section on the sunglasses you will see with width size, bridge width, and temple length. It could be a good idea to look into those if you are unsure how they will fit you, but for the most part the main size that will determine how big they will look on your face is the width length. I also recommend reading the reviews. They can sometimes be a great indicator on how the glasses will actually fit. 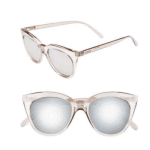 Where is your favorite place to buy sunglasses for your face shape?! Let me know in the comments below. I would love to hear your thoughts on this. If you enjoyed this post don’t forget to share it with your friends! 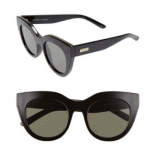 Read next: Check out these amazing cat-eye sunglasses for under $10!